Again, I know that everyone and their sister is making these right now. I combined this tutorial at The Creative Crate with this tutorial at Fireflies and Jellybeans. I cut a 2x4 into three blocks. 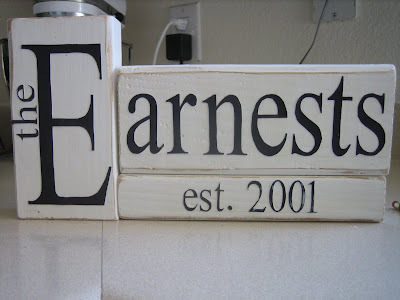 The E is on a 6.5 inch block, and the other two are cut to 8.5 inches. I sanded the blocks and painted them creamy white. When dry, I sanded the edges for a little bit of a worn look. At the time I made this, I did not have my Silhouette, so I simply cut the letters out of cardstock with an Xacto knife and Mod Podged them onto the blocks. Simple. I really like the clean, classic look of the black and white, but you could easily use scrapbook paper instead of paint to give it a different character. As noted elsewhere, a great gift for many occasions!